Update (Nov, 2012): I’ve posted a much more functional version of ClockworkMod Recovery here. It has a much better user interface and is much easier to work with. 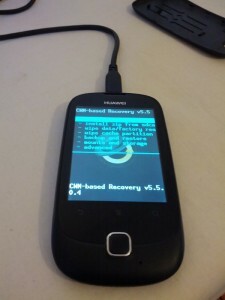 I’ve just finished porting ClockworkMod Recovery to the Huawei U8185 (Ascend Y100). It took a bit longer than expected because I didn’t have a stock ROM to inspect, and I was playing it a bit safe. Long story short: ClockworkMod Recovery is now available for the Huawei U8185. I’ve tested flashing Superuser as well as a nandroid backup. I haven’t yet tried a restore. There is an issue with the back-button functionality (soft keys don’t work, and the “Go back” menu option doesn’t always appear). 1 I’ve uploaded a copy of fastboot for convenience, but you should be able to find a copy somewhere if you just search. It’s an open source tool. July 8, 2012 July 26, 2016 Alan OrthComments are off for this post. Quick one, I can flash Clockworkmod without rooting right? hi i need help im stuck the volume down + power button doesn’t work i dunno what happened but i can still go to the volume up+power button now my phone is stuck can you help me please…. i’m stuck on a colored screen when i try to turn on my phone help i just bough my phone ………….. If you tell me the screen is colored, it helps to say which one? Is it pink? Yank the battery out and boot it again. You’re trying to install the U8150 CyanogenMod for U8185? I would rather put my time into doing a source port. I’ve already set up a device repository: https://github.com/alanorth/android_device_huawei_u8185. That’s where we should be putting our energy! Also, we should be doing CM9 instead of CM7. hi Alan, i will try to work on cm9 and any progress i will let you know. thanks. hi Alan, I created a cyanogen rom, on the 1st installation it failed displaying no booting.img, on my second installation displayed installation complete but had a problem on booting, that’s my progress. How i created the rom; i had a cyanogen zip rom, extracted, downloaded root browser, used it to copy system folder( copied file after file, arranging them in a similar folder created in the sd card, eliminated files that had no importance, used the same format as the cyanogen zip file) I created a META-INF file for zip installation which worked properly. hey, was i heading the correct direction? Hi Allan. Great stuff. However am stuck. I’ve successfully flashed clockworkMod but can’t find the superuser zip at the link you provided (http://goo.im/superuser). Can i use any superuser zip e.g the one at http://downloads.androidsu.com/superuser/Superuser-3.0.6-d-signed.zip, or must i have the one u specified? You can’t find the link because goo.im’s servers crashed recently. Twice. So devs haven’t re-uploaded their files yet. Glad you found Superuser somewhere else, though. btw, The “efghi” means “Eclair, Froyo, Gingerbread, Honeycomb, Ice Cream Sandwich”… (Android versions). Hi Alan, how far now have you gone on CM9 working with U8185? I didn’t have time to post it here yet, but I posted to Google Plus, Twitter, and the Nairobi Linux Users Group. Here’s the status of CyanogenMod 9 on the U8185: https://plus.google.com/101880444013156960674/posts/gn2jgiasgvu (hint: it’s booting, and running like a dream). are you supposed to copy the clockworkmod_5.5.0.4_u8185.img to your sd card? That means fastboot can see your device. If it only says “waiting for device” you might need to try sudo fastboot devices. Glad it could help you. I still haven’t spent much time on this phone… but I have managed to get CyanogenMod 9 and 10 (ICS and JB) to boot on it, though it still needs a lot of work (modem, wifi, etc). I hate the stock Huawei ROM! hi allan. i would really need some hel here. am trying to root my phone n having a problem in flashing the phone with clockwork mod. 1st i downloaded the android sdk pack which has the fastboot (u recommended for flashing)and installed it in local c:. i tried to open fastboot but nothing happened. i opened cmd prompt. typed c: trying to find the path of fastboot but it was not recognised. would someone pliz give me a heads up bcoz i really need a rooted phone. i would really appreciate if someone clearly notes down the steps of installing clockwork mod n superuser for me n other android newbiez. Sorry, I don’t know how to do it on Windows… I haven’t used Windows in like 10 years 🙁 When I get time I may try to find a way to flash ClockworkMod Recovery from the U8185’s existing stock recovery… no promises though! Hey guyz…i really need a link or a custom ROM for huawei U8185….i flashed the previous ROM and now am stuck I cannot find a compatible ROM for this device…pliz help. I don’t think there ARE any custom ROMs for this device… I started porting CyanogenMod 9, but haven’t worked on it much since August. Keep checking my blog, I’ll start back up soon hopefully. Lograste rootear tu Huawei Ascend Y100, U8185???? crees que me podiras ayudar a indicarme como hacer con el mio?? tengo problemas de espacio por los programas que vienen de fabrica y el volumen es muy limitado. no logro entender los foros, mi ingles debe mejorar y no puedo permitirme dañar el cel. Awesome! Glad to have helped. One day I’ll write up proper instructions… including an XDA forum post. This phone isn’t as popular in Kenya yet, but I want to make sure the information is ready once the people decide to search for it! Don’t install ROM Manager; it won’t help you on this device. I don’t know how to use Windows, so I’m afraid I can’t help you for now. Once I get time I may find someone to make an easier method for ClockworkMod Recovery, and with Windows-specific instructions. I downloaded that one the other day but haven’t tried it yet. I don’t have time to mess with it right now, sorry! thank you man it work perfect … but when I boot into recovery mode whatever command I choose the CWM display the logo (the hat over the arrow) and not responding what is wrong???? Use the power button to go backwards. Use the menu key to enter, and arrows to select. I will post a new version of CWM Recovery soon (version 6.0.1.x), which is much easier to use. I am not a genius of phone softwares but I am sure with the proper instructions from you I can root my Ascend Y100 that I bought recently. The best thing you can do now for those of us think all this is rocket science is to give the most detailed of instructions on rooting the Ascend Y100. Personally I have net yet succeeded in opening the bootloader. I hope you will hear my cry and respond accordingly. Here’s the stock recovery for U8185: http://www.mediafire.com/?rgupc6pi4p7a52i Good luck! What are you trying to do? Have you already flashed using fastboot? hiiii alan i was trying to find the surperuser zip but any that i have find work on the phone can you try to upload yours ? if you have it ? hey Allan…finished yet porting the CM9 for huawei u8185? hey Alan, I use windows in flashing the recovery and also superuser into the device. its simple, just need pdanet for android installed in your computer and the fastboot, adb, adbWinApi and adbWinUsbApi files then start command prompt and use fastboot to flash the recovery into the phone when in bootloader mode. I rooted my huawei ascend y u 8185, Is there any way on how I can go back to my original mode? Root is “normal mode”… what are you trying to achieve? Make sure to wipe data / factory reset when moving from Huawei ROMs to CyanogenMod. Hi Allan, where can i find the original huawei u8185 romrom. I installed the r0_de-branded rom and im getting my phone hang up every now and again. Besides Wi Fi doesnt seem to work for internet connectivity though the phone “sees” and connects to available hotspots/ connections.